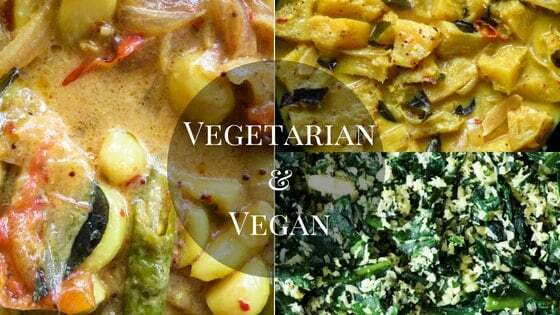 A vegan/vegetarian delicacy you won’t be able to resist. If you haven’t made fried banana flower seeni sambol then you should try making this rice puller. 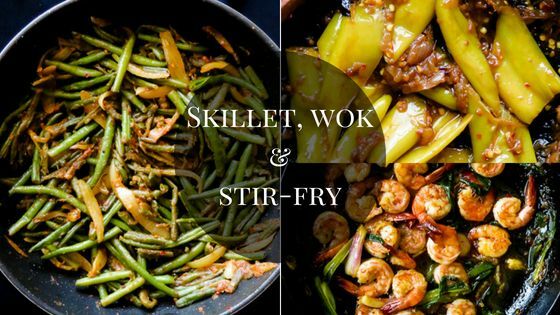 It’s a delicious fry you won’t be able to resist with rice and curry. Make a large batch, bottle, refrigerate. This way you can use the banana flower fry(seeni sambol) whenever you want. A slice of toasted bread topped with a fried/ poached egg will taste so much better with a spoon of this Sri Lankan kesel muwa(seeni sambol) fry. Or slather a few slices of bread with butter, use the fry as a filling and make some sandwiches for your kid’s lunchbox or work. 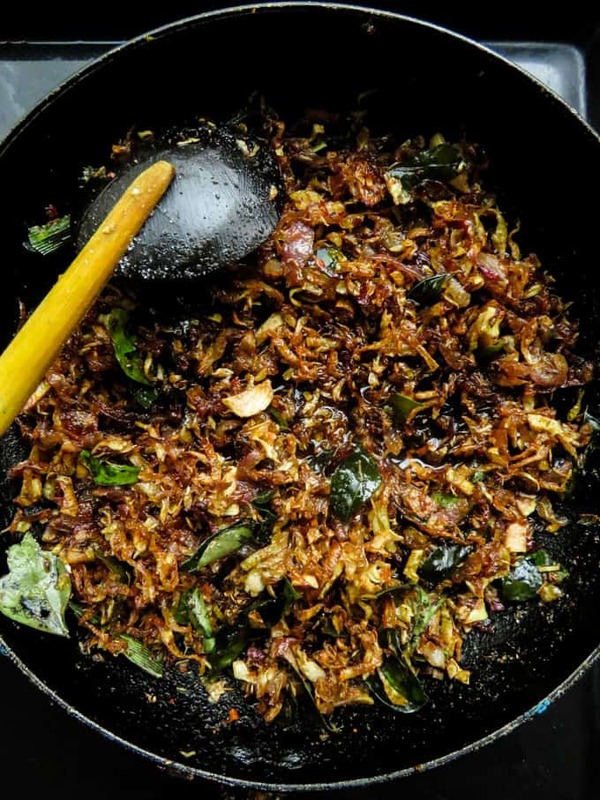 With its crispy texture of onion and fried banana blossoms, this Sri Lankan recipe comes together in three steps. 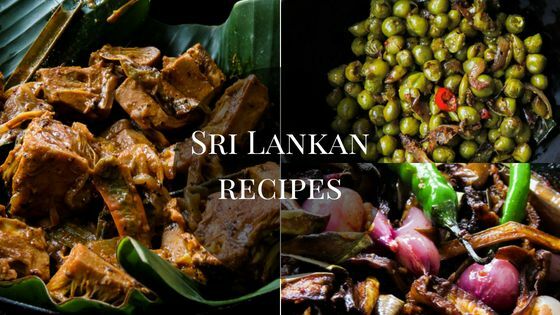 You can also add the banana fry to any of the Sri Lankan lunch menus given in the blog and enjoy! You will need three bowls(2 covered in paper towels, one with turmeric,salt and water in it). A large strainer to drain the soaked and chopped banana blossoms. A large pan to fry the onions and banana fry, then combine it. 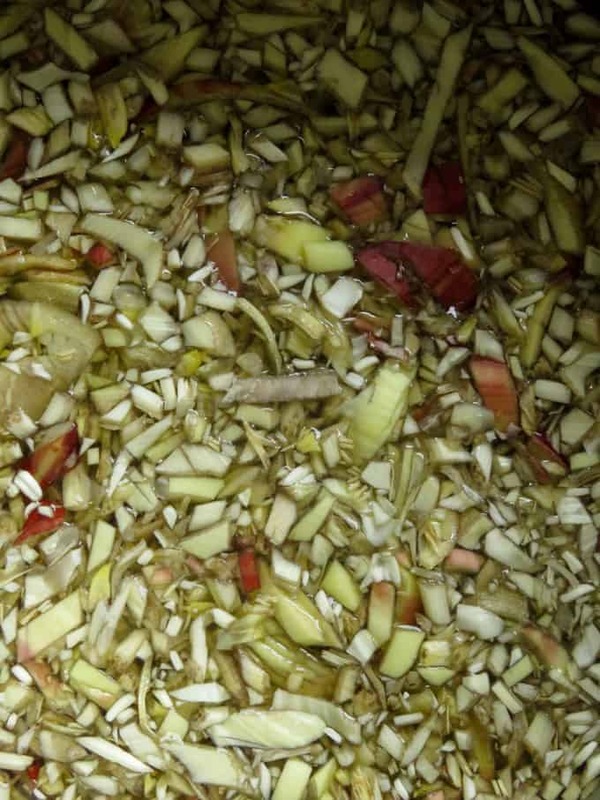 Clean banana blossom as per instructions given below and soak them in turmeric-salt water. Fry the banana flower until golden. Fry onions slice until golden. 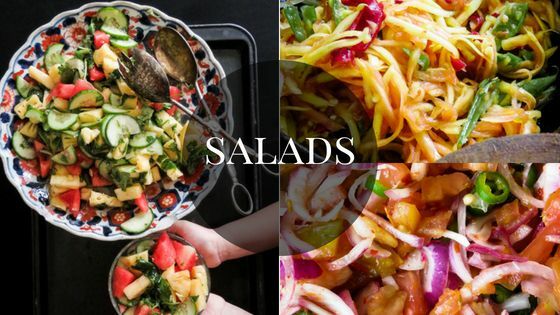 Combine all three components of the recipe. 1 banana flower cleaned and washed as per instructions below. A small bottle/500ml of vegetable oil to be used as per needed. 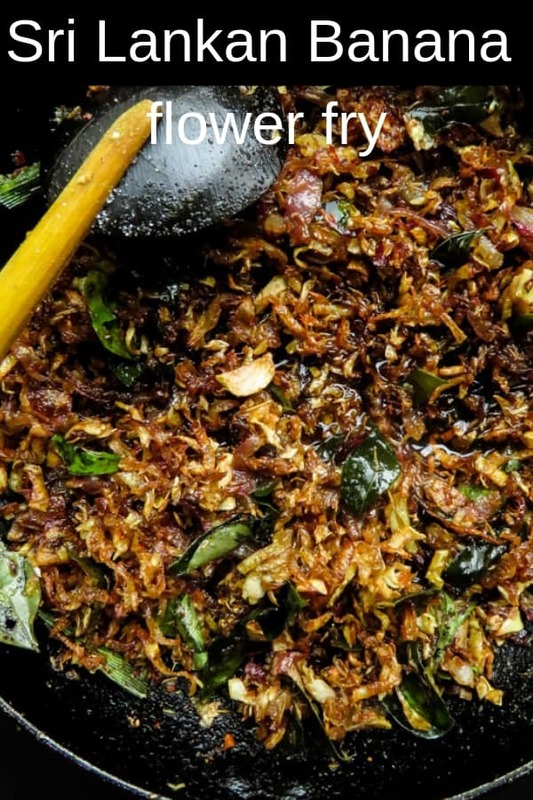 Gather all utensils and ingredients needed to make the Sri Lankan banana flower fry. Keep in mind there are three steps to this recipe. 1. How to clean banana blossom/flower. Have a pan of water with turmeric and salt stirred into it. Wash and rinse off the banana flower. 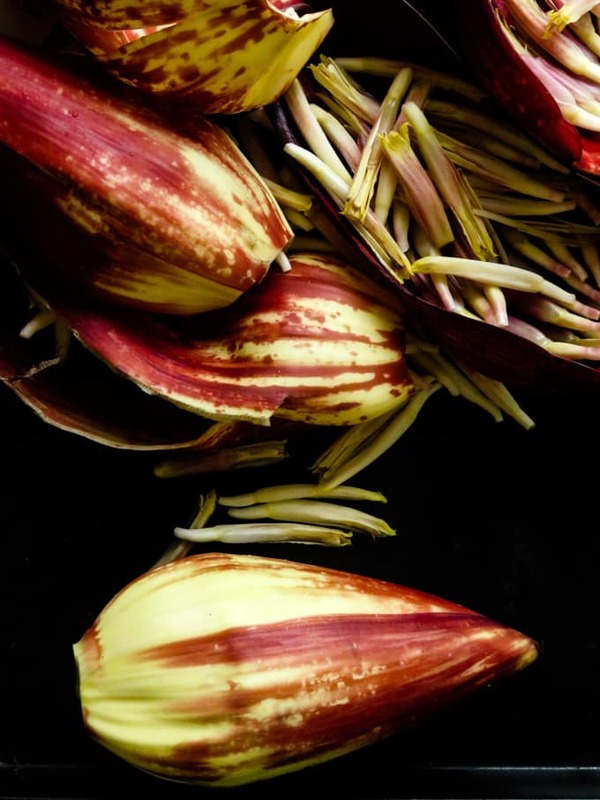 The banana flower is made up of layers, they consist of banana leaf and tiny long flowers attached at the bottom. these actually turn in to bananas as the flower matures. Remove the purple skins and flowers, you might have to go through three layers to finally get to the part of the banana flower we use. Once you reach the heart of the flower, you will notice there won’t be any tiny flowers attached to it. this is the part which we use. 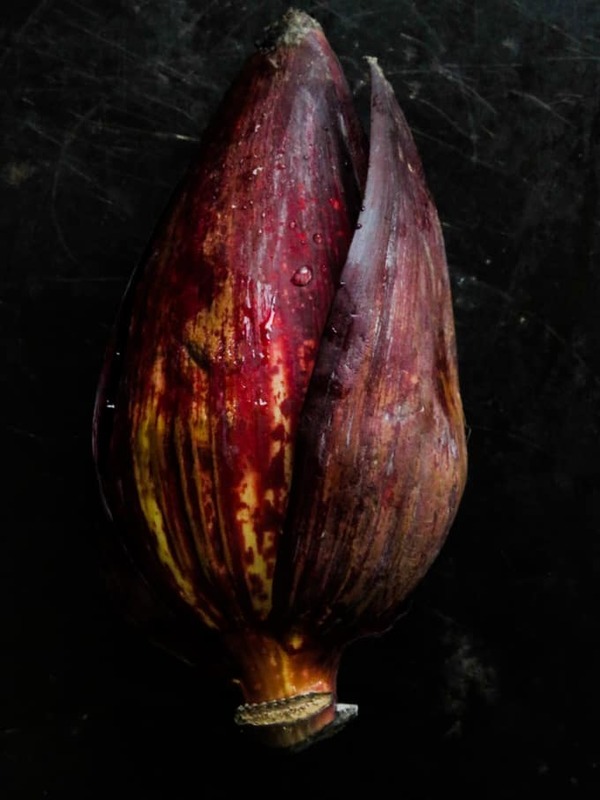 Place the banana flower on chopping board, cut the stem off and slice them into either very thin strips or chop them as I did. As you slice, transfer them immediately to the pan of water, turmeric and salt to soak. Leave them in the water for 5 minutes then using a large strainer, drain the water and then squeeze out any excess water from the chopped banana flowers using both hands. This might take a few minutes and messy as the chopped pieces tend to stick to your fingers but gather as much as you can. Once this is done, peel and slice the onions as well and set aside. 2. Frying the chopped banana flower and onions. Have two separate bowls with kitchen paper towels. Place a deep frying pan over medium fire, pour at least one and a half cup of oil into the deep pan and gradually bring the oil to medium heat, maintain this heat and do not let the oil smoke. It’s time to fry the chopped banana fry and the onions. Since there might still be water in the chopped banana blossom, make sure you add them slowly to the hot oil. In small batches fry the chopped banana flower for 3-5 minutes or until they turn to a dark golden brown. Avoid frying them to a dark brown as they will bitter in taste. Transfer the fried banana flowers to the kitchen paper towels to drain any excess oil. Leave a few slices of onions for tempering. Then repeat the same with onions and fry them until golden brown, transfer to the bowl with kitchen paper towels. 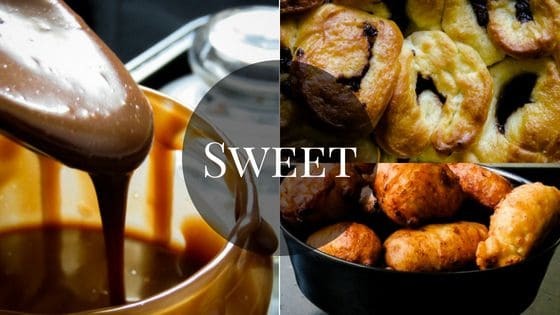 Tempering and combining all ingredients. If there’s a lot of oil remaining in the frying pan, transfer it to a separate bowl. Add 3 tablespoons of that oil to the pan. 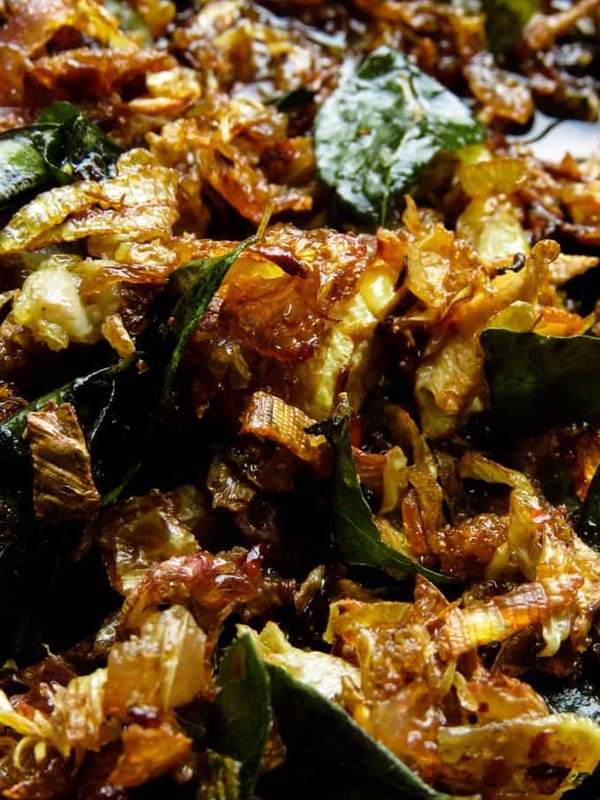 Add curry leaves, pandan leaf, a few slices of onions, cardamom, cinnamon, chilli powder, curry powder, chilli flakes, salt to season and temper ingredients over medium fire for 2-3 minutes. Once the onions turn golden brown, add sugar, tamarind juice and cook for further 2 minutes. 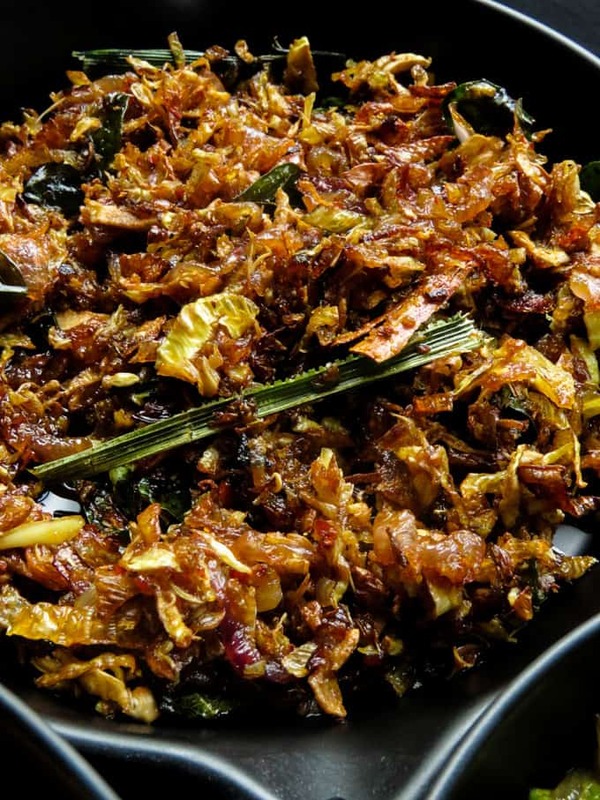 Reduce fire to low, now add the fried banana flowers followed by fried onions, combine both ingredients well in low heat for a few minutes(3-4). Taste and season with salt if necessary, you can add a teaspoon of sugar(sugar needs to dissolve so add when the fry is still cooking over low flame)as well to balance the taste. Let it cool, transfer to an air-tight bottle and refrigerate, use when needed. ALSO KNOWN AS KESEL MUWA SEENI SAMBOL– A VEGAN/VEGETARIAN DELICACY YOU WON’T BE ABLE TO RESIST. IF YOU HAVEN’T MADE FRIED BANANA FLOWER SEENI SAMBOL THEN YOU SHOULD TRY MAKING THIS RICE PULLER. Keep in mind there are 3 steps to this recipe. How to clean banana blossom/flower. 3.Tempering and combining all ingredients.